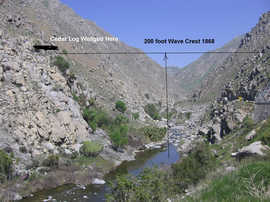 This diagram shows the approximate height of water at the mouth of Kern Canyon during the 1868 flood. 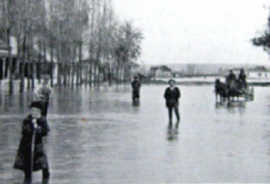 This flood picture was taken 19th and 22nd Streets in 1893. 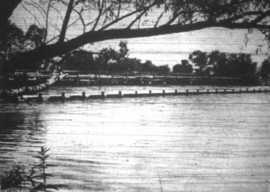 Bellevue Weir in the 1941 flood. 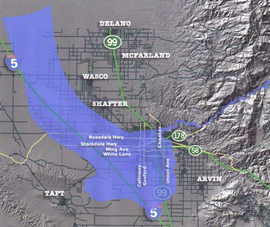 A map of flood the plain in the Bakersfield area. The local Native Americans built their shelters in areas high enough to avoid the rising waters but near enough to the rich bottom land to raise yearly crops. Their village site at Kern Island was called Reeder Hill; it was located on a large mound where the Burlington Northern Santa Fe railyards now exist. The river’s channels and sloughs changed each time the floods arrived. There were but a few settlers living in the lower portions of Kern Island, and for the few years they lived there, the rising winter runoff spared their tule or adobe homes. Christmas Day, 1861, though, was not like the past light floods that occurred regularly. The flood waters slowly rose during the night. Within a few hours, every home in low-lying areas was washed away. The settlers swam or boated to high ground and were welcomed by the families fortunate enough to have avoided the flood. The rain and flooding lasted for two months. Before this flood of 1861-62, the river channel ran where the Kern Island Canal now runs by the Beale Library on its way to the Kern Lake bed south of Greenfield. After the flood waters finished grinding out their new bed, the river had cut its new channel, which ran just east of Mercy Hospital through Old River on its way to Buena Vista Lake. After this great flood, many homesteaders moved away from the Kern Island flood plains, disgusted with the constant flooding. It was September 1863 when the colonel moved into the log house he’d purchased the previous year from Christian Bohna. The house was located at what is now 19th and M streets. Colonel Baker had purchased title to a swamp reclamation project and hired Native Americans to perform the necessary levee and dam building. Our little village began to grow to a population of 600. Crop production increased greatly due in part to the toll road to Havilah Colonel Baker constructed to provide a good route to the booming mining camps in the Kern River Valley. From 1863 until 1867, the town streets were laid out and travelers passing through on the Old Immigrant Road were beginning to refer to Kern Island as “Baker’s Field” due to the hospitality shown them by Colonel Baker. In the colonel’s swamp reclamation project, levees were constructed between the river and the town site to protect the city from a normal high-water runoff, but no one even dreamed a flood as enormous as the one to come could ever descend upon young Bakersfield. Totally abnormal weather conditions prevailed in 1866 and 1867, which had never occured before and have never happened since. This unusual weather pattern led to the most spectacular distaster to occur in Bakersfield prior to the 1952 earthquake. The rain fell constantly over all of California in November and December 1867. By Christmas Day the Kern River had risen near the tops of the levees, but no flooding occured. Volunteers constantly patrolled the river banks protecting against any signs of a breech in the levee system constructed by Colonel Baker. The river then gradually receded until near the year’s end, when the river flow totally stopped for two days. The people of our city realized something strange was occuring, but because the rain had subsided for the last few days, they concluded everything would soon return to normal. On New Years Day, 1868, Residents were awakened to the loud roaring sounds that were accompanied by the very earth trembling. The tidal wave of trees, boulders, ice and brush thundered down the river channel and created a 50-foot-high logjam near where the Chester Avenue Bridge now exists. This towering pile of ice, uprooted pines, cedars and oaks dammed the channel, which then ran through town and created a new bed which is the present Kern River channel. A great mountain of trees saved Bakersfield from sure destruction by detouring the great flood around town, to the west and onward to Buena Vista Lake. Although the town was flooded by a foot of water on Chester Avenue, the townsfolk felt fortunate to have escaped the great tidal wave. Two previous years of heavy snows, with no high country summer between, had set the stage for the natural distaster that occured. The huge accumulation of snow in the high Sierras had become practically one huge, ice glacier. Warm, heavy rains from the South Pacific poured down upon this heavy ice crust for weeks. The mountains became water-soaked, and the soil, ice, uprooted trees and boulders avalanched into the canyons below. About 30 miles up river from Kernville, nature was about to go mad. The mountainside that slid into the upper Kern River was about a square mile in size, according to a pack train that passed the location a month later while using the Jordan Trail to Death Valley. The eastern wall of the river’s canyon at this point was about 3,000 feet high. The temporary lake formed behind this great landslide was estimated to have had a depth of about 1,000 feet and extended 12 to 16 miles upstream. The remains of these lakes still exist and are named Kern Lakes. Finally, after filling all week, the raging river overflowed the top of this great dam. In a matter of minutes the tremendous mass was washed away. The massive wall of water, ice, uprooted trees, soil and rocks scoured the canyon walls. Trees tumbled end over end, uprooting more trees as they thundered toward the city. Colonel Baker’s son, Thomas A. Baker, was 11 years old at this time and an eyewitness to the events that took place. The week after the flood had subsided, a shepherd informed young Thomas of a large cedar log that the flood had wedged into the boulders very high upon the North wall at the Canyon’s mouth. Tom and his friends later climbed the steep canyon wall to inspect the tree the flood had left. The uprooted cedar tree was about 40 feet long and four feet in diameter, was badly scoured and scraped from its long trip from the high Sierras. This log was deposited about 20 feet above the end of the powerhouse tunnel that was built 30 years later. This location is about 200 feet above the river bed, which meant the tidal wave was about that high. Local fishermen and hikers climbed the cliff to inspect the rare cedar log for years until the power house’s wooden flume was being constructed in 1894. The cedar was cut up for use in that waterway. Hundreds of thousands of logs were scattered over the south end of Kern Coumty as far as Buena Vista and Tulare lakes. The mesa where Kern River Golf Course is now situated was covered with hundreds of large uprooted trees. The flooding of Kern River, combined with the flooding of all the rivers flowing from the Sierras, made the Central Valley a lake of water from Buena Vista Lake to the San Joaquin River. Small logs covered an area half a mile square on the Canfield Ranch east of Elk Hills. In 1868 Tom Barnes built a log cabin with them, this house is now a popular attraction at Kern County Museum’s Pioneer Village. The flood of 1893 didn’t quite get into downtown Bakersfield, but it came a block from 19th and Chester Ave. Westchester, Fruitvale and the Rosedale Colony Farms were badly flooded. These farmers were mostly recently arrived English emigrants, and this flood bankrupted many of them because drought had decimated their crops the previous year. These floods usually occured on or near Thanksgiving, Christmas, or New Year’s. Floods continued to occasionally overflow onto farmland and into downtown Bakersfield till the levees were improved enough to protect against any normal high water. From 1914 to 1917, Arp Addition, which was Oildale in its infancy, seemed to get flooded every time the river rose. The odd thing was, three floods in a row Arp was flooded and Bakersfield was not. Hard feelings against Bakersfield soon caused loose talk about men opening gaps in Arp’s North levees to let the river flood Oildale and not Bakersfield. Finally, in 1917, state and county funds were appropriated and a complete levee system was built high enough to keep Arp’s Addition dry. Beardsley School and Beardsly Dance Hall were elevated above the flood zone, and washed-out families were invited to live in those buildings until their houses dried out. Sometimes it took months before a family could return to their home. Local businesses, lodges and private citizens donated money and material freely to the displaced flood victims of old Arp Addition. The flood of 1950 was the last to cause damage — Isabella Dam was under construction at that time. This flood washed out the Kernville Bridge, Rancheria Bridge, Gordon’s Ferry Bridge, Olcese’s Ranch Bridge and Enos Lane Bridge. The Chester Avenue bridge was saved only by the quick work of county crews who placed cranes on the bridge and removed driftwood and debris as it accumulated against the east-side bridge piers. The water level almost reached the bridge highway, but the efficient levee system prevented floodwaters from entering Bakersfield. The year 1966 proved how important Isabella Dam was to Bakersfield’s safety. The crest of the great 1966 flood, above Isabella Lake at Kernville, was more than 100,000 cubic feet per second. This was nearly double the highest water ever recorded. Isabella Lake filled completely and flowed over the spillway. If the dam had not been built, engineers calculated all of Bakersfield would have been swept away as well as oil fields, farms and industry amounting to billions in damage. Isabella Dam and our well-reinforced and inspected levee system surrounding Bakersfield along with the multiple canals to channel water away from town have made us totally safe from flooding. We should never have to awaken in the night with water running through our homes which the pioneering families experienced quite often. No wonder Bakersfield’s pioneer residents often built their homes on stilts and had a boat in the barn.